Ballybunion situated 9 miles west of Listowel is one of the most popular seaside resorts in Ireland. With it’s magnificent golden-sand beaches together with the therapeutic quality of its waters, it became a popular holiday resort in the early 1800’s. In 1837 Samuel Lewis recorded his views of a visit to Ballybunion: ‘This village……. has recently become a place of resort for sea-bathing and is much frequented on account of the highly interesting and romantic caverns with which its cliffs are indented’. Following the commencement of the Lartigue Railway in February 1888 there was rapid growth and development in the area with the building of Hotels and Guest houses. Today the town boasts two Blue Flag awards for the cleanliness and water quality of the Men’s and Ladies’ beaches. The 3.2km Long Strand looking out towards the Atlantic spans the the shoreline overlooked by the two magnificent Ballybunion Golf Courses. The Nuns strand is a secluded picturesque beach overlooked by the superb Cliff Walk,- a must do stroll whilst visiting Ballybunion. Today, the town is once again enticing visitors with an interest in wellbeing. The MOYA (Mindfullness, Ocean,Yoga and Arts) bi-annual festival has garned exceptional interest from near and far. The town is noted for its famed golf courses, surfing, seaweed baths, great cafés, gourmet restuarants and great places of entertainment and plenty facilities. Incidentally, the Men’s and ladies beaches are no longer segregated. Ballybunion Castle, a Tower House, was built by the Geraldines in the 13th. Century. It stands on the site of an old promontory fort now known as the Castle Green which divides the beach in two. The Castle has been ravaged by Atlantic storms and Sea breezes for the past seven centuries. The East wall alone remains rising to a height of 12.1 metres. During the winter of 1998, The Castle was struck by lightning and the upper part of the tower was damaged. In 2014 the Office of Public Works carried out some remedial work to stabilize the wall core and the foundation on one side of the Castle. The people of Ballybunion look forward to the Castle been restored, in the not too distant future, to its iconic image prior to the lightning strike. The Castle is the emblem of the world famous Ballybunion Golf Club. Mary O’ Malley was born in the year 1836 approx. 3 miles from Ballybunion. It was while working in Kilkee, Co. Clare that Mary met John Young, a wealthy English tea planter who had recently been widowed. Mary and John were married and subsequently moved to London. When John died sometime between 1860 and 1870, Mary moved firstly back to Dublin and eventually back to Ballybunion. The first residence which Mary built was in Doon Road. That residence was completed in 1870 and she lived there for 12 years. In 1883, the Mercy Order established in Mary’s residence a convent and a Secondary School. Mary Young’s contribution to the schools is memorialised in the schools logo. Some years later Mary proposed the building of a new church to be funded in total by herself. The construction of the church commenced in 1891. In the same year construction also commenced on Mary’s new house which was finished in 1893 at a cost of £1,700. The house later became known as Dr. Hannan’s House. Mary died on the 19th August 1894 having never set foot in her new home or the church she had funded. The church cost £18,000. Ballybunion Golf Club was founded on the 18th August 1893 at a meeting in the Castle Hotel in Ballybunion. The laying out of Ballybunion’s first ever golf course was thanks to a small group of enthusiastic locals under the direction of a golf professional contracted and paid by the Lartigue Railway Company. In 1926 a second 9 holes were added to bring the course up to 18 holes. In 1981 Tom Watson made his first visit to Ballybunion. The following year in the euphoria of sinking an ‘impossible’ chip shot to win the US open, he extolled the virtues of Ballybunion to the world’s golf media. Tom Watson put Ballybunion on the map in a manner that nobody but he could manage. From that moment on, Ballybunion received the Golf World’s attention and acclaim. The new opulent clubhouse was built for the Centenary Year 1993. In 1995, Golf Digest nominated Ballybunion as ‘The No. 1 Golf Course outside of the USA’. Every year since then, the Old Course Ballybunion continues to be listed high in world rankings. The adjoining Cashen Course, designed in the early 1980’s by Robert Trent Jones Sr, continues to grow in stature as one of the finest Golf links in Ireland. Over the years many great golfers and distinguished guests have played Ballybunion. On the 5th September 1993, President Bill Clinton played the Old Course and made a return visit in 2001 to play both. Two world ranked golf course in a small village is indeed some achievement and privilege. Charles Lartigue, a French Engineer, designed and created the unique monorail system. The locomotive and other cars draped saddle-style over a single rail 1 metre high atop A-shaped trestles. The first train rolled into Ballybunion on the 29th. February 1888. It carried visitors, locals and goods for over 36 years between Listowel and Ballybunion. The Lartigue was busy though rarely profitable during its first 25 years of operation. About 40 people worked on the line. The Lartigue operated bringing many tourists to Ballybunion until its closing by the High Court who appointed Receivers to the Company in 1924. In 1912, work started on the construction of the Ballybunion Marconi Transmission station. The Company bought 72 acres of land from the Landlord Mr. George Hewson. 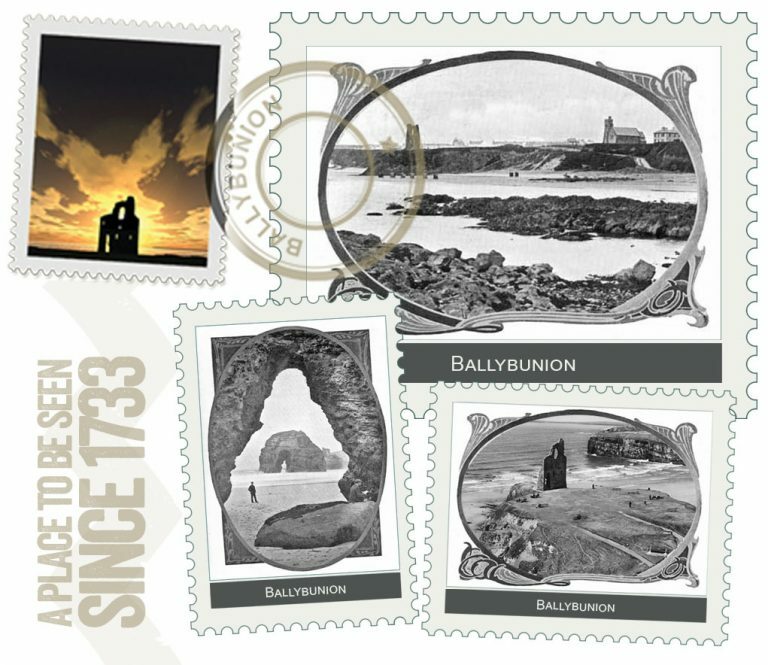 Ballybunion was chosen due its flat land area and its direct line to the USA. Materials for construction came from Listowel using the famous Lartigue Monorail. The first east-to-west transatlantic voice transmission was made from a Marconi station in Ballybunion to the Louisbourg station, Nova Scotia in March 1919. The Centenary year will be recognised in March 2019. However, owing to the Civil War in Ireland, it was decided for security reasons to dismantle the Ballybunion Transmitter station. The building was vacated in 1922.